Live text commentary on the BBC Sport website from 19:00 BST on 23 October. Students' tall stories can be sky-scraping in stature. Famous mates. Wilfully obscure music tastes. Improbable acts of consumption and consorting. Deyna Castellanos' tale is true. On Monday, the 18-year-old Venezuelan will swish up the red carpet of London's Palladium theatre and sit alongside Lionel Messi, Cristiano Ronaldo and Neymar in the front row at the Fifa's Best Awards. Castellanos is nominated, alongside Lieke Martens of the Netherlands and American Carli Lloyd, as the planet's best female footballer. And yet Castellanos does not play in a professional league. She has never featured in an under-20s international tournament, never mind a senior one. The evening before Fifa announced its shortlists, she scored a superb 30-yard free-kick, but for her Florida State university team in a 2-1 win away to Louisville. She was surprised as anyone. "I was with a swimmer friend of mine. We were talking and watching the announcement show at the same time," she told BBC Sport. "I couldn't believe it. I was so emotional. My friend, he is also Venezuelan, said he was so proud of me. "Then I called my mum at home and she started to cry as well." The news spread from there. Castellanos' Florida State team-mates surrounded her at the hotel breakfast table and smothered her in embraces. Congratulations flooded in on social media. Not all the reactions were so positive. A leftfield pick means someone closer to centre stage misses out. In the case of this Fifa shortlist that was Sam Kerr. The Australian set a single-season scoring record in the United States top-flight with 17 goals for New Jersey's Sky Blue FC, alongside seven international goals this year. While Martens' role in driving the Netherlands to Euro 2017 made her an obvious choice, the callow Castellanos and Lloyd, whose fame dwarfs her 2017 achievements, were not. "Not surprised really, it's Fifa," said Kerr when asked for her reaction to her omission. "To be honest, I turned the Twitter off for a few days. I wasn't getting my hopes up. " Some have accused Fifa of promoting a future face of the women's game instead of rewarding the excellence of the present. If so, their help has come a little early. Castellanos, in the second year of a four-year course in Communications, is bound by the rules of college sport governing body, the NCAA. Bright, friendly and bilingual, she will be marketing manna, but she is currently subject to one of the strictest amateur codes in sport - unable to appear even in posters plugging Florida State games. For now it is just about the goals. And there have been a lot of them. In 2014, as a 14-year-old, she was joint top-scorer at the Under-17 World Cup. She topped the scoring charts again at the 2014 Youth Olympics and at the under-17 South American Championships in 2016, before notching another five at the Under-17 World Cup 12 months ago. She has 14 in 15 games so far for Florida State this season and six in nine for Santa Clarita Blue Heat - the Californian pro-am outfit she turned out for in the off-season. The numbers are impressive, but the showreel even more so. Front and centre is the goal that is up for Fifa's Puskas award on Monday - a mammoth 94th-minute lobbed winner straight from kick-off against Cameroon that kept her side's World Cup campaign alive. She won the goal of the season in the American second division with a precisely-plotted 30 yard chip. Then there is a nimble turn and rifled finish against Canada. A Bergkamp-esque flick over the shoulder and ice-cool slot against Brazil. Or a kung-fu volley en route to a collegiate hat-trick. The opposition may be age-grade or second-tier, but the goals are top class. The temptation is to draw an analogy with the men's game, imagining perhaps that Jadon Sancho - a star for England Under-17s, an unused sub for Manchester City and now Borussia Dortmund - had been nominated for the men's award. Technical ability is less likely to be trampled underfoot in women's football. If you are good enough, you are old enough, with less need to wait for a youngster to fill out or bulk up. But with professional leagues rare and a discounted degree a sensible fall-back option, the American collegiate system - stacked with gleaming facilities - is the proving ground for many of the best young female players from around the world, as well as the vast majority of American prospects. Patty La Bella is the US-based host of the Women's World Football Show. She has no doubts. 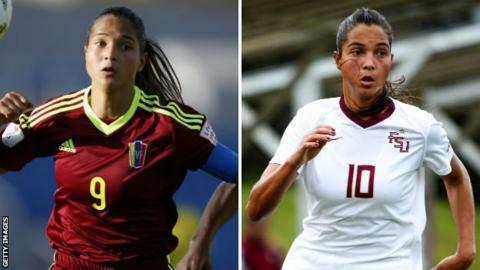 "Honestly, if I had to pick between watching the US national team playing and Deyna Castellanos, I would pick Deyna every day," she told BBC Sport. "I love watching her. She is very quick on the ball, has extraordinary ability to change direction and can finish from anywhere. "She reminds me of a young [Brazilian five-time player of the year] Marta. That is a hard tag to hand on a young kid, but I haven't seen anything that suggests anything different. "A lot of people feel that she hasn't been tested, but I have been watching this kid since she was 14. I think she is one of the best footballers that I have ever seen. "I might be in a minority but I think Fifa got it right. I don't mean that as any slight on Sam Kerr, but Deyna is exactly what Fifa likes - a dynamic, fun player who people are going to stand up and take notice of." Had Richard Castellanos had his way, Deyna's ability would not be known beyond the family's hometown of Maracay in the far north of Venezuela. Deyna's ability was spotted as a five-year-old when a coach saw her playing with a ball on the sidelines of her older brother Alvaro's practice sessions. Richard told his daughter that football was a man's sport, not one for little girls. He reckoned without Deyna's mother though. As his work as a hardware wholesaler took him far from home, Yrene Naujenis hatched an alternative plan. "My mum told me that when she was young, she was basically the same, playing men's sports," Castellanos said. Castellanos played for an academy side run by former Borussia Monchengladbach playmaker Juan Arango - Venezuela's record goalscorer and cap-winner - before making the move to the United States. "It was me, her and my brother and I kept going to practice. "But he saw I loved it and allowed me to continue." Football is one of several challenges now though. Castellanos is starting her adult life, learning English and studying for a degree, all 1700 miles from home. "It was not hard to leave my family, but the language was harder," she said. "I only really knew how to say 'hello' and 'yes'. I understood more, but it was hard communicating with my team-mates, coaches. Now though I have a lot more confidence and I love it here. "Occasionally somebody from Venezuela or another Latin American country will stop me for a picture on campus, but, considering there are 45,000 students here, it is not a lot." Castellanos - a Barcelona fan - wants to move to Europe once she graduates. Could a WSL side fit the bill? "Well, we'll see," she laughs. If she wins Fifa's top prize, it won't be her Tallahassee present or European future on her mind though. While she is prospering abroad, back home, Venezuela is slowly folding in on itself. With inflation running at 700%, some her compatriots are taking payment in meat rather than cash. The government is struggling to print passports fast enough to keep up with demand from would-be emigrants, and the dismal form of the men's football team offers no respite from steepling crime rates and widespread social unrest. "I have lots of messages telling me to keep working, telling me that I am making my country, my family and all of the people that I love proud," says Castellanos. "Everything I do here is thinking of the national team and thinking of the Venezuelan people, my family and Venezuela. For me, Venezuela is the best." On Monday, we will find out if Castellanos is Fifa's Best.